Memberships with a built-in bonus. Costco is always looking for ways to reward its members. That’s why now through June 30, 2019, you will receive a Costco Cash Card when you purchase a new Costco Membership. Join the 93 million Costco members who’ve already said yes to shopping smarter with low everyday prices on quality brand-name products and exclusive member services. 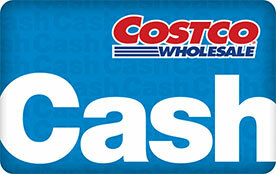 Costco Cash Card only good at Costco. *To redeem this new member promotion, click “Join Today” to purchase a Membership Activation Certificate (MAC). Then print and present the MAC at any U.S. or Puerto Rico Costco warehouse membership counter to join as a new member. Cash Cards promotion is only valid for nonmembers for their first year of membership. Limit one Cash Card per household. Promotion is nontransferable and may not be combined with any other offer or coupon. You must join in person with a Costco representative. Costco Cash Cards are not redeemed for cash. A Costco membership is $60 a year. An Executive Membership is an additional $60 upgrade fee a year. Each membership includes one free Household Card. Please include sales tax in all applicable states.